The rapid evolution of technology has allowed health professionals to begin to adapt to these changes and deliver healthcare in a new, remote fashion. More recently, mHealth has come into play, which refers to the concept of using mobile devices, such as phones, tablets and smartphones in both medicine and public health . mHealth is seen as an enabler of change worldwide because of its high reach and low-cost solutions . The change towards technology-based practice and more specifically smartphone-based applications is an extremely relevant area for health professionals to effectively communicate and treat a variety of patient groups. Therapeutic compliance has been a topic of clinical concern since the 1970's due to the widespread nature of non-compliance with therapy and rehabilitation programs . It can be proposed that these recent advances in technology can help improve therapeutic outcomes. Specific to physiotherapy home exercise programs, smartphone applications provide a new and emerging way to deliver physiotherapy that promotes active participation from both the physiotherapist and patient throughout the course of treatment. The purpose of this wiki is to provide an educational resource for physiotherapists of all experience levels to reference and understand the concept of telerehabilitation. 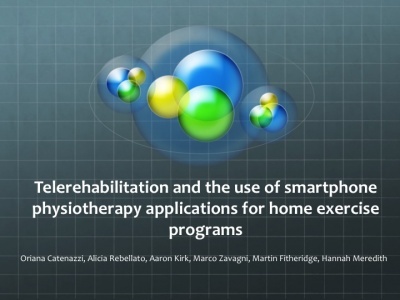 Physiotherapists can apply this knowledge to adapt clinical practice and utilize smartphone applications as a means to facilitate patient participation in home exercise programs. The information presented in this wiki will also be beneficial for all allied health professionals looking to better their understanding of this emerging role for technology in various health professions. The wiki will present an introduction to telerehabilitation to help the reader understand the past, present and future trends in healthcare technology and how the Scottish Government is supporting these advances. Secondly, the reader will be engaged into key patient behaviours that will allow the physiotherapist to better understand factors that influence patient participation in a rehabilitation program and motivation for change. Lastly, smartphone physiotherapy applications will be introduced for use in a musculoskeletal setting to demonstrate how telerehabilitation and awareness of behavior change can facilitate patient participation in a physiotherapy home exercise program. This information is crucial to maintain a healthy and evolving physiotherapy-patient relationship for the future of physiotherapy practice. Information presented in this wiki may be used towards attaining a CPD. 3) The learner will be able to critically appraise current applications available to physiotherapists to develop and monitor patient rehabilitation programs. In recent years, technology has revolutionised all aspects of medical rehabilitation, from developments in the provision of cutting edge treatments to the actual delivery of the specific interventions . Telerehabilitation refers to the use of information and communication technologies (ICT) to provide rehabilitation services to people remotely in their home or other environments . Such services include therapeutic interventions, remote monitoring of progress, education, consultation, training and a means of networking for people with disabilities. Using technology to deliver rehabilitation services has many benefits for not only the clinician but also the patients themselves. It provides the patient with a sense of personal autonomy and empowerment, enabling them to take control in the management of their condition . In essence they are becoming an active partner rather than a passive participant in their care. It enables access to care for individuals in remote areas or for those who have mobility issues associated with physical impairment, access to transport and socioeconomic factors . In addition, it cuts down the associated travel costs and time spent travelling for both the healthcare provider and the patient . Research has found that the rehabilitation needs for individuals with long-term conditions such as stroke, TBI and other neurological disorders are often unmet in the patient’s local community . As telerehabilitation expands, patient continuity of care improves. It enables clinicians to remotely engage and deliver patient care outside of the medical setting, thus eliminating the issue of distance between clinician and patient . This opportunity to continue rehabilitation within the patient’s own social and vocational environment should lead to greater functional outcomes . The shift in the global demographics towards an increasing elderly population brings with it an associated increase in chronic health conditions . This highlights the need for changes to be made in the delivery of rehabilitation services with the incorporation of self-management strategies and technology. Figure 1 below represents the predicted growth in the elderly population in the UK. 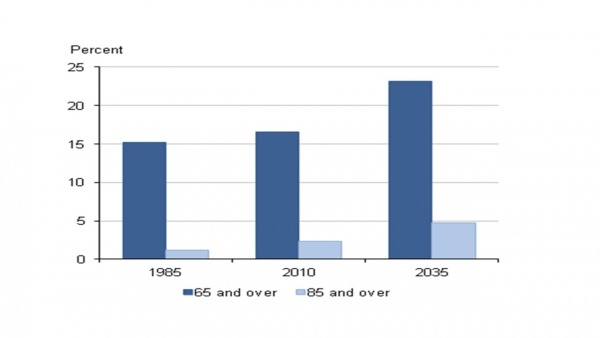 It indicates that by 2035, individuals aged 65 and over will account for 23% of the total population . Figure 1. Predicted growth in the elderly population in the UK. Growing numbers of elderly people have an impact on the NHS, incurring considerable health costs due to the growing demand for treatments . It is hoped that by integrating telehealth measures, these costs will be reduced. Kortke et al (2006) found a significant improvement in patient outcomes when using telerehabilitation with a 58% reduction in cost in comparison to in-patient rehabilitation . Generally, most systematic reviews that have been carried out investigating the efficacy of telerehabilitation report the patient’s perspective on its use as a positive experience with significant clinical outcomes . The hope for the future is to continue to develop and use new, innovative technologies that will transform current practice and make telerehabilitation an integral part of healthcare . Telerehabilitation for physical disorders has been short lived. The problems that arose for this type of rehabilitation stemmed from the difficulties it imposed on the so-called “hands on” therapies, particularly physiotherapy and occupational therapy . However, as technology has progressed in healthcare, the possibilities for effective telerehabilitation in therapies such as these has improved (Figure 2). Figure 2. 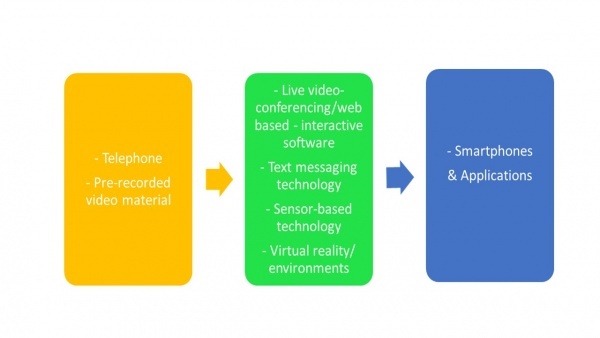 Progression of technology in telerehabilitation. Early research into telerehabilitation was introduced with small pilot studies. In some of the first projects, clinicians used the telephone to provide follow up and to administer self-assessment measures . From this, telerehabilitation continued to progress into the 1980’s with pre-recorded video material for client use and interaction . Eventually, live interactive video conferencing was introduced . The potential uses for video conferencing in healthcare and telerehabilitation became apparent in the 1990’s with many projects being carried out in physiotherapy. In a randomised control trial (RCT) by Russell and colleagues (2011), the efficacy of this internet-based telerehabilitation system was assessed versus conventional physiotherapy in the provision of outpatient rehabilitation to patients who had received total knee replacement (TKR). Comparable results were reported with the two rehabilitation methods and patients were satisfied with the telerehabilitation treatment provided . The use of videoconferencing allows for the provision of consultations, diagnostic assessments and delivery of treatment interventions as well as providing verbal and visual interaction between participants. However, problems lay initially in the inability to measure participant’s physical performance; for example in physiotherapy, these would include measures such as range of motion and gait. This was soon overcome by measurement tools that were able to objectively quantify participant’s physical performance . Developments continued to be made using sensor and remote monitoring technologies for within the home which further enhanced the benefits of these new innovative technologies of telerehabilitation . 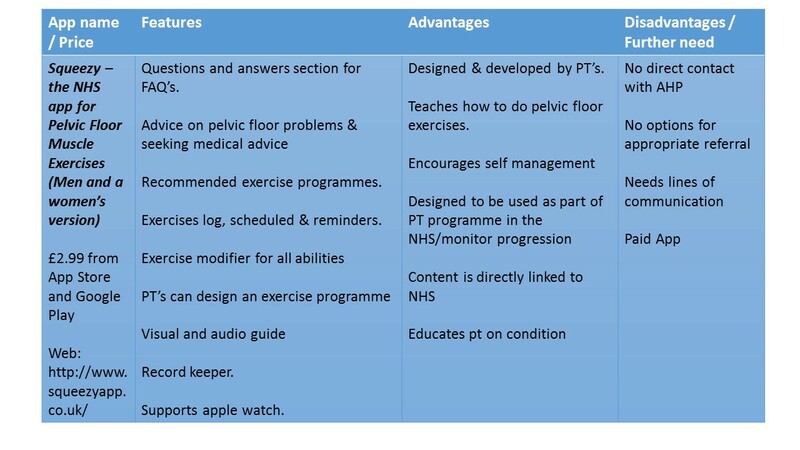 These developments provided a means of home-based exercise monitoring by the patient and the rehab professional while also enabling the professional to track patient compliance to specific exercise programmes . Virtual environments are another technological method introduced to healthcare. These allow users to interact with computer generated environments in real time . Virtual reality begins with real world scenes which are then virtualized, thus mimicking real world environments . It enables healthcare professionals to design environments which can be used in areas such as surgery, physical rehabilitation and education and training. 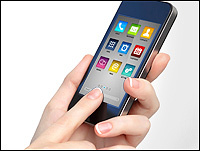 In recent years, smartphones have revolutionised communication within the medical setting. This modernisation is allowing the opportunity to provide medical support when and where people need it. Recently, it has been reported that half of smartphone owners use their devices to get health information , with one fifth of smartphone users actually using health related applications (apps) . There are a wide range of mobile apps available for healthcare professionals, medical students, patients and the general public . In the innovation of mobile technology, mHealth (mobile health) in particular is helping with chronic disease management, empowering the elderly, reminding people to take medication at the right time, undergo scheduled exercise, extending service to underserved areas and improving health outcomes . There are currently a vast range of mobile apps, interactive tools and podcasts that cater for an array of healthcare conditions and disabilities both formal and informal, recognized and promoted by the NHS . 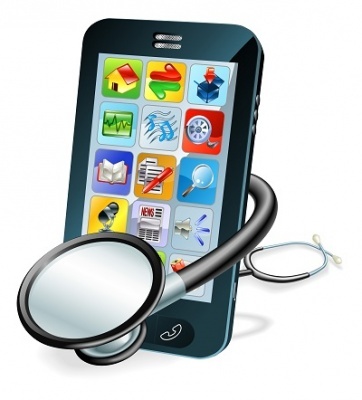 In 2012, there was an estimated 40,000 health-related apps available . Those formal in nature allow patients to record and send health measures and send them electronically to physicians and/or specialists. As such the National Delivery Plan 2012 documents that by deploying technology in healthcare “provides an opportunity to treat patients in new ways and helps manage rising costs and demand” . Theoretically, this allows for greater access to healthcare provisions, availability of care and supports self management and prevention in routine care, thereby reducing unnecessary admissions (therefore speeding up the treatment of patients requiring medical intervention) and helps to reduce healthcare costs in an aging population . 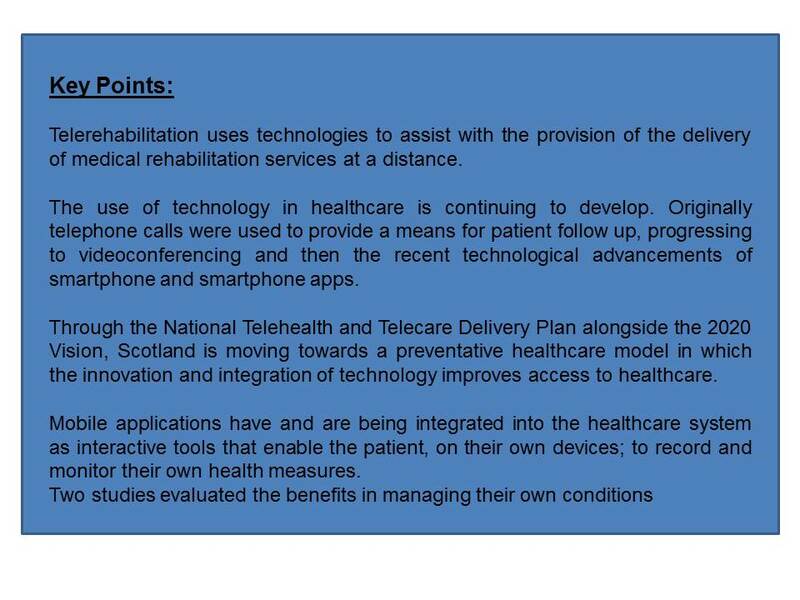 “A National Telehealth and Telecare Delivery Plan for Scotland to 2016: Driving Improvement, Integration and Innovation” . In December 2012, the Scottish government in collaboration with CoSlA and NHS Scotland fabricated a joint national delivery plan. In essence, it sets out the vision and direction of a Scotland in which the use of technology, playing an increasing role in our everyday lives, will be integrated into service development and delivery. Their view is that this plan will essentially transform and improve access to and availability of service in our homes and communities and more acute settings . The track has deviated to an integrated direction of revolution due to the fact that in less than a generation there have been rapid changes in two very particular and fundamental elements within Scottish society. The first is the shift to an ageing population (as has been previously documented) and secondly, there is the development of mobile phone technology and its use. It is reported that in less than a decade the use of mobiles by adults has gone from less than 50% to over 90% . Therefore, with increase demand for healthcare due to an ageing population with multiple comorbidities, it is viewed that with the use of technology, and specifically mobile technology, some of the healthcare burden can be lifted to manage long term conditions . The National Telehealth and Telecare Delivery Plan for Scotland focuses on the period up to 2016, and has been rooted within and seamlessly entwined with the long term forecasted ambitions of the 2020 Vision for achieving sustainable quality in the delivery of healthcare services across Scotland . Through the use of technology explored throughout this wiki, it is apparent that each plan coincides on the basis of everyone able being to live longer healthier lives at home, in a “homely” setting. .
NHS 24 continues to work with NHS boards to develop the use of telehealth across its four priority areas (stroke, mental health, COPD and paediatrics). These are prevalent long term conditions that have considerable health costs to the NHS where using integration and innovation of telehealth measures would enable not only cost efficiency but also those all important factors of access to healthcare, contact frequency and potentially improving the physician - patient partnership . The inclusion of the SCTT as part of NHS 24 therefore, provides a much stronger focus to drive the development of telehealth nationally and for Scotland, altering the mode of service delivery. Much has been said about the demographic changes, including an aging population, increased life expectancy and a greater prevalence of chronic conditions, so far, putting increased strain on the healthcare system in Scotland, the UK and worldwide . We know that there has been a lot of pressure on the health care service and systems to reduce the average hospital length of stay and getting patients home earlier. Consequently, in-home telerehabilitation programmes are increasingly common as an alternative mode of service delivery . In the two studies above, the telerehabilitation concepts that have been evaluated may also be transferable to different services for conditions that benefit from community rehabilitation of home treatment or monitoring i.e. short and/or long term conditions, and those that result in restricted movement or mobility. Such conditions may include long term degenerative conditions, chronic diseases or musculoskeletal conditions. Over the last decade the development and use of telehealth interventions for changing patient behaviours has greatly increased. The use of mobile applications must take in account the physical and socio-psychological needs of health practitioners and patients. The user approaching a device, is not purely interested in what the device does, but rather how the device makes them feel: the developer must remember that the application is developed focusing on the customer and is designed to satisfy all their needs. The ability to access extensive and multifaceted programs provides health care professionals with the opportunity deliver behavioural change interventions that can be adapted to meet the patient’s characteristics, behaviours and environment . In order to analyse the effectiveness of these interventions, health behaviour theories and models are used to guide the development and delivery of the intervention. The Transtheoretical Model  and Self-Determination Theory (Deci and Ryan, 2000) have served as the basis for many health care interventions and it is important that the physiotherapist understands the underlying principles behind these theories. The use of health behaviour models and theories will assist the health care professional at the initiation stage of the intervention to meet their baseline characteristics of the patient and also during the intervention when behaviour change is taking place. To understand our patient fully it is necessary to examine their motivation, efficacy, and goals, then apply a theoretical model to our intervention. 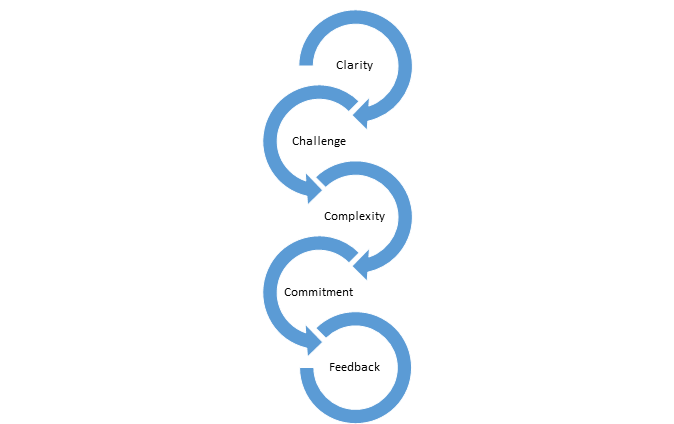 The TTM consists of five stages related to behavioural change, pre-contemplation, contemplation, preparation are the motivational stages of the theory where the idea of changing behaviour varies from not at all to ready to change . These stages are followed by action and maintenance, during these stages the behaviour has been modified for less than six months and then established over the next six months. Depending on how the individual reacts to the process of change progression and regression between stages can occur. 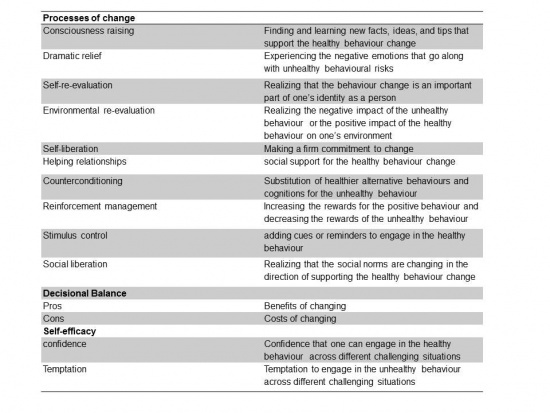 There are ten processes of change that need to be considered when changing behaviour and each can relate to specific stage in the model hese are the actions taken by the individual to develop a rationale for their changing behaviour it will help them overcome any potential barrier they may encounter in their pathway through the stages of change. Prochaska et al. (1992) proposed that the effectiveness of the process of change will vary according to the individual's stage of readiness to change. From a physiotherapy perspective the processes of change could affect an individual’s behaviour towards an intervention in numerous ways. For example, consciousness raising will make the patient more aware of why they are performing the intervention, Self-liberation will provide the individual with the belief that committing or recommitting to an intervention will lead to behavioural change and to act on that belief and helping relationships such as the relationship between physio and patient will also help to facilitate change. These are just three of the ten processes of change and each process may have an impact on different stages of change. The aforementioned will affect the pre-contemplation, contemplation and action stages of the TTM. Furthermore within the TTM there are different measures of behaviour that affect the individual's progression through the stages. These measures include decisional balance , self-efficacy and temptation. The decisional balance aspect of the theory involves weighing up the pros and cons of changing. 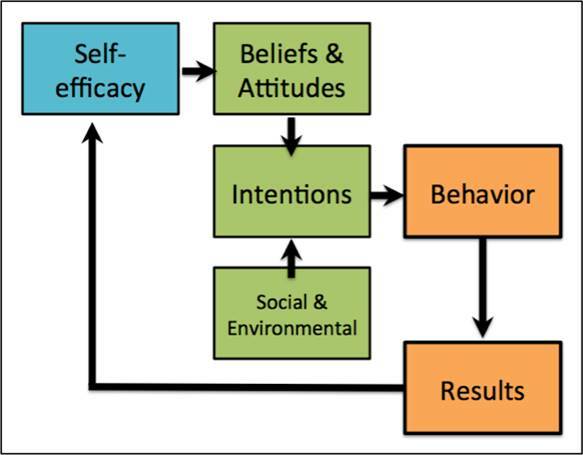 The use of self-efficacy within this model was adapted from Bandura’s self-efficacy theory. It is defined as the confidence the individual has in their ability to cope with situations where a relapse is extremely likely. Temptation is the intensity of urges to engage in a specific behaviour when the individual is in a certain situation. These concepts can be analysed by a temptation measure or a self-efficacy measure as both are similar in structure. These outcome measures are particularly useful in that latter stages of change and beneficial establishing why a relapse has occurred ). If we examine the model as a whole, the stages of change are the central construct of the TTM, the processes of change are theorised as independent variables, and decisional balance, self-efficacy and temptations are hypothesized as intermediate dependent outcomes. The TTM has been used in a telehealth setting previously via a mobile phone interventions. Obermayer et al. (2004) and Riley et al. (2008) used text messaging (sms) interventions to promote smoking cessation and found 25% difference in participants who managed to quit smoking after six weeks using the same intervention and a similar patient age group. Therefore using the TTM could be beneficial for specific patient groups within a physiotherapy setting as long as the intervention develops as the patient progress through the stages of the model in order to develop the desired behavioural change. The ICF framework takes into account all the biopsychosocial factors necessary for regaining health and is well established within physiotherapy practice. 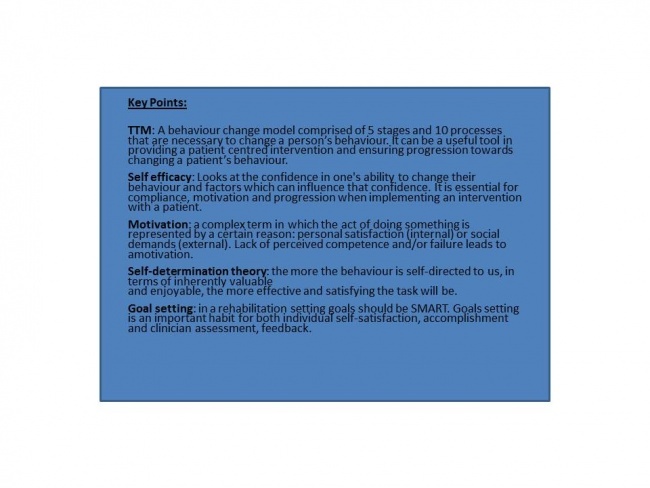 The use of behaviour change models, in particular the TTM, can work in harmony with the ICF framework and as suggested by Riley et al. (2008) should be adapted to meet the needs of the individual over time. 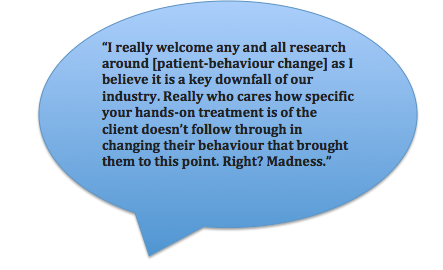 When a physiotherapist is implementing an intervention for a specific patient, the goals will be patient centred. Therefore the physiotherapist must understand what the needs of the patient and investigate these needs further and establish the barriers and facilitators which may present themselves during the intervention. Once the appropriate subjective and objective examinations have been implemented the correct application and choice of techniques is imperative and there must be an assessment of whether or not the intervention has been successful. As the patient is moving through the stages of change the ICF model will be used at each stage to ensure patient centred practice. It is important that we, as the physiotherapist look at all the biopsychosocial considerations before developing our clinical reasoning for a behavioural change intervention. Self- efficacy theory was first proposed by Bandura (1982) it refers to an individual's sense of confidence in their ability to execute a specific behaviour in different environments. An individual’s level of self-efficacy will depend on the amount of perseverance and effort applied to a specific behaviour. The individual's view of their efficacy may shape their actions, effort and attitude. An essential component of self-efficacy theory is that the stronger the belief a person has in their ability to perform a set of actions, the more likely they are to comply and maintain participation throughout an intervention. However, those who have an inferior amount of self-efficacy could apply less effort and have an increased chance of relapsing when trying to change their behaviour. Furthermore Bandura (1997) suggest that a person's level of self- efficacy is based on personal beliefs rather than objective assessments. Therefore a person’s beliefs can often predict their behaviour more accurately than their capabilities. This can result in a behaviour level that does not match the individual's capabilities and could be why behaviour between individuals varies even when they have similar understanding and skills set. It could then be argued that having self-efficacy alone could be sufficient enough to initiate a behavioural change. 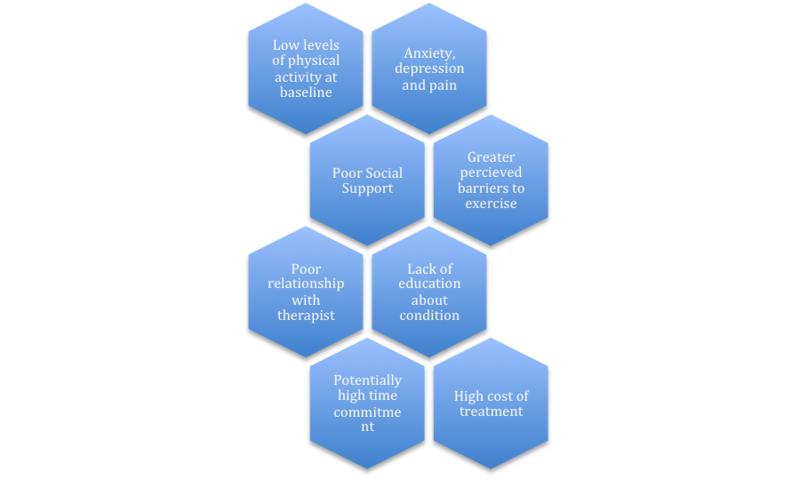 There are many barriers to self-efficacy especially in the elderly and vulnerable populations that telehealth interventions are designed for. Misunderstanding the ageing process among older adults may result in restricted activity levels. Lack of knowledge about the benefits of exercise may produce a dismissive attitude toward participation towards interventions involving physical activity. More so, Supposed ill health and symptoms related to physical disabilities associated with chronic disease are reasons behind dropping out of an intervention. Within this population group many of the barriers to activity are attitudinal and we must use the self-efficacy theory in order to provide appropriate interventions that install confidence and believe in the individual to help them to modify their behaviour. Existing literature has concluded that self-efficacy-based interventions to improve physical activity levels had a significant effect on outcome measures such as distance walked among older adults and improvements in physical activity levels, but not in self-efficacy itself. This could indicate that self-efficacy is not necessary for bringing change in physical activity behaviour. This has been further emphasised by Calfas et al. (1997) and McAuley et al. (1994) who also used theory based interventions and found no connection between self-efficacy and behavioural change. Another limitation with self-efficacy literature especially with physical activity interventions is the lack of reporting by the authors on the actual content of the intervention making it difficult to compare interventions and standardisation of behavioural change techniques. Conversely, physical activity interventions aiming to improve self -efficacy have improved confidence and the individual's adherence to physical activity interventions. Existing research confirms that self-efficacy beliefs are critical in the initial adoption of an exercise routine. If the participant is able to believe that they can exercise under circumstances that could result in the relapsing behaviour it is more likely that they will take part in exercise intervention. Therefore including self-efficacy theory in the design of physical activity intervention would be advantageous in guiding the participant towards adopting a new behaviour. Furthermore, In a systematic review by (Ashford et al. 2010) they found that self-efficacy was increased when the parts of the intervention was performed by a peer prior to the participant taking part and therefore knowing that another person was able to perform the activity gave the participants increased confidence in their own capabilities. In summary self -efficacy is a vital component of behavioural change, confidence in one’s ability to perform a certain behavioural change intervention. Looking at self-efficacy from a physiotherapy perspective it would apply the same principles as the physical activity interventions mentioned above. Influencing beliefs and establishing barriers to interventions could be influential when developing a telehealth intervention. Self-efficacy could be essential in patients complying with any intervention that may be beneficial to their health including mobile applications aimed at a specific injury, a health condition or chronic pain intervention. Motivation is complex term, and has been subjected to various definitions and approaches. Csikszentmihalyi defines motivation as “a phenomenal experience being a sufficient reason for action”, which then lead Deci and Ryan to further develop its content focusing on the “functional significance of events” as the main determinant for motivation. Intrinsic motivation, which denotes the act of doing something because it is inherently interesting or enjoyable thus leading a person to act for the fun or challenge rather than because of external prods, pressures, or rewards. Spontaneous behaviours, which confer benefits to the organism, are not completed for any instrumental reason rather than constructive experience associated with exercising and empowering one’s capacities. Amotivation, which refers to the state of lacking an intention to act. Individuals who are amotivated lack intentionality and sense of personal causation due to the fact that they are not valuing an activity, not feeling competent to do it, or not believing it will lead to a desired outcome. External regulation, in which individuals perform tasks to satisfy an externally imposed demand. Introjection, in which individuals perform tasks in order to avoid guilt or anxiety or to enhance self-esteem. Identification, in which individuals identify the own importance of a behaviour, accepting its rules as his or her own. Integration, in which individuals entirely assimilate rules and regulations and those are congruent with his or her own values and needs. Motivation between individuals varies in amount, level (how much?) and orientation (what type?). Orientation of motivation refers to the essential attitudes and goals that lead to the development of a certain action (why are we doing this?). Research across various settings supports the role of communication in enhancing psychological functioning, self-regulation and intrinsic motivation. The ideal situation is that an individual is able to self-monitor himself because he truly believes in the intervention and knows how this is intrinsically important for him/her or because enjoyment of the activity leads to the adoption of a certain lifestyle. If neither self-consciousness or enjoyment could lead an individual to change its behaviour towards a healthier lifestyle, family encouragement and family cohesion could determine better outcomes within the rehabilitation setting. The quality of motivation is enhanced when any of these needs is satisfied, optimized if all three are satisfied and diminished if the person feels frustrated. A person’s motivation for an activity is a dynamic and constant continuum which development is based on certain aspects. External factors reduce feelings of autonomy thus prompting a shift from autonomous to controlled motivation or amotivation. On the other side, several other factors promote autonomous motivation. Motivational states exist along this SDT continuum with amotivation (a state in which there is no intention to act) being the bottom form of motivation and intrinsic motivation (a state in which an action is performed for purely joy and interest of the activity itself) being the top form. Extrinsically motivated behaviors, cover the continuum between amotivation and intrinsic motivation, varying in the extent to which their regulation is self-determined. These include external regulation, introjected regulation, identified regulation and integrated regulation. Externally regulated motivation (i.e., the least self-determined form of extrinsic motivation) results in behaviors performed to obtain rewards (e.g., praise, monetary compensation) or to avoid negative consequences (e.g., criticism from others). The Aristotelic theory of final causality, in which every action is caused by a purpose, is the basic connection between Ryan and Deci Self-Determination Theory and Locke Goal-Setting theory. Goals have both internal (ideas) and external (object or condition to which they refer) aspects. Goals vary in content (the inner object) and intensity (the scope, focus of the selective process). The more difficult the goal, the greater the achievement. The more specific or explicit the goal, the more precisely performance is regulated. Goals that are both specific and difficult lead to the highest performance and commitment. Commitment to goals is attained when the individual is convinced that the goal is important and attainable. Clarity: Goals are measurable and unambiguous. There should be no misunderstanding regarding which behaviours will be rewarded. Challenge: Goals are challenges. If a task is too easy, don’t expect the accomplishment to be significant. Complexity: if Goals are highly complicated, make sure that the individual won’t fight in the face of overwhelming odds. Commitment: Goals acceptance implies effort, over time, towards the accomplishment. Feedback: provides knowledge on progress towards the Goals. 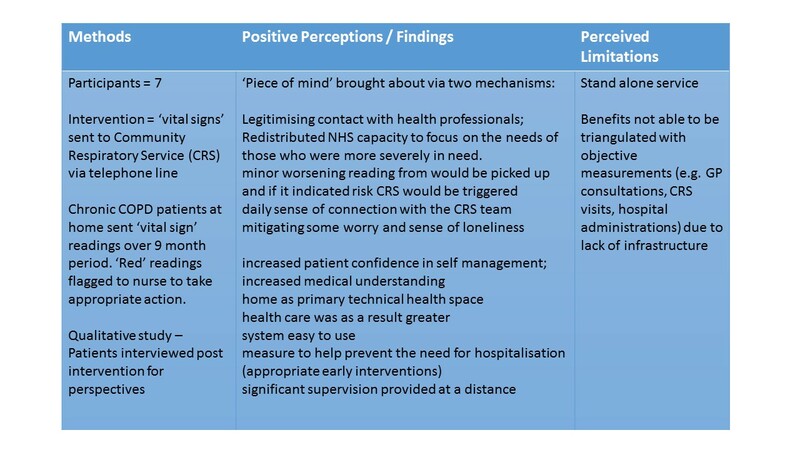 Measured, by patient or by health carers or by both? Achievable, but may still be challenging! Future research could focus on improving our telehealth behaviour interventions but also our theoretical and practical understanding of health behaviour change. However, from the research associated with specific models as a theoretical basis for other types of intervention there is generally an improvement in patient behaviour. In the development of applications is important that we can tailor the intervention to suit the individual and are able to SMART set goals, motivate and ensure progression through behaviour change models in the short term as well as in the long term. Following an understanding of what motivates patient behaviour and adherence to healthcare treatments discussed above, this section will look more specifically at factors that have an impact on the patient’s ability to respond and agree to treatment in the form of home exercise programmes (HEPs) as well as the potential for healthcare and physiotherapy smartphone applications to deepen the patient-physiotherapist relationship and improve overall rehabilitation of the patient in a musculoskeletal setting. In an outpatient setting, an HEP is tailored to an individual patient and targets their specific problems, as identified by the Physiotherapist. This exercise schedule, modified with repetitions, sets and/or additional strengthening/ endurance components, is to be performed by the patient in their home environment between treatment sessions with the Physiotherapist. Continuation of training at home ensures that a patient will begin to improve and that their progress can be monitored throughout time. The continued tailoring of the HEP from each session by the physiotherapist must be complemented by the patient’s continued determination and trust in their shifting programme. The understanding and commitment between both the patient and their physiotherapist to achieve both short-term and long-term goals indicates a better outcome for the patient once they are back to (or potentially better than) their baseline. However, various reports monitoring patient compliance with and to an HEP show non-adherence rates to be as low as approximately 20% (; ). In addition to factors and models described above such as goal setting, self efficacy, intrinsic and extrinsic motivation (self-determination theory) and the transtheoretical model there are other circumstances which can affect the ability of patients to respond positively to a home exercise programme. While demographics such as age and gender have been shown to have little effect on these rates (), there are a few factors that that have been discovered and discussed in the research that may affect compliance such as those included in the Figure below. Through a greater understanding of the patient perspective, Physiotherapists alongside the multi-disciplinary team can work to target and ensure that patients are kept on the right track and allow greater improvement of quality of life. However, with an adherence rate of 20% keeping most patients isolated from full recovery, what can we do to strengthen the patient-physiotherapist relationship? This is where the potential of telerehabilitation comes in. Discussed in the beginning sections, telerehabilitation is the modernization of healthcare-related treatments and services. Mobile technologies are still fairly recent and just starting to emerge; therefore there is not a wealth information or research on their use or advantages.This section will focus specifically on the potential of smartphone related applications from a global context and the software features that serve to deepen the relationship between the physiotherapist and patient, as well as alleviate some of the potential factors for non-adherence as discussed above. The following table compares key features of four different smartphone applications used worldwide in the creation and training of the HEP for the patient. Descriptions of their key HEP features, communication outlets, patient tracking and costs are outlined below. PhysioTrack is a clinic branded exercise prescription application developed by PhysioTrack Ltd., an Irish software development consultancy. The mobile application was launched in 2013 by Anthony Nolan, a former patient and long-distance runner who created PhysioTrack after having a hard time remembering his own home exercise programmes after clinical appointments. PhysioTrack is in partnership with sportEX (provides evidence-based research), TM2 private software (which allows safe and accurate patient tracking) and University College Dublin (for provision of exercise photographs for the software). The application is free for students to use. It is typically recommended for musculoskeletal outpatients, although the application allows free uploading of pictures and prescriptions to be shared privately within a clinic. PT Pal is a HIPPA compliant smartphone application launched in 2013 that was designed as a patient-centered approach to increase patient compliance with home exercise programs. Naveen Khan, a patient who was having difficulty adhering to her own physiotherapy program, is the founder and CEO of PT Pal. The application includes an exercise database for allied health professionals including Physiotherapists, Occupational Therapists and Speech and Language Therapy. This application is constantly expanding and caters to multiple patient groups such as adult, paediatric, cognitive, specific care such as hip and knee as well traumatic brain injury. For the purpose of this wiki we will be discussing the app’s use for general musculoskeletal injuries for adults in physiotherapy practice. PT Pal is an application that aims to solve patient non-compliance by storing, tracking and scheduling a patient's physical therapy exercises. MyPhysio App is an Australian Clinic branded smartphone application available for use on both Android and Apple app stores. According to MyPhysio App, they are the only application which helps the user’s patients and the user’s own business to grow (through clinic branding and ‘push notification’ marketing). MyPhysio App creator Triton Tunis-Mitchell argues that the world is becoming more digital, and as a result Physiotherapy needs to as well. Photographs and videos are stored inside the application with a timer function on the patient’s smartphone so patients can ensure that they are performing the allocated exercises efficiently and effectively. 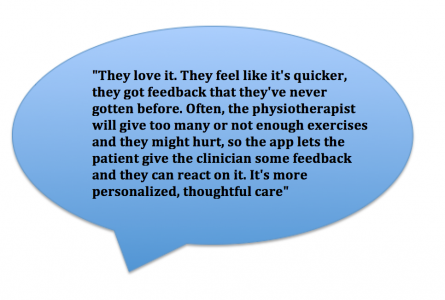 Online reviews from both Physiotherapists and patients rave about the usefulness of the application claiming it is easy to use and better than ‘those stick figures’. Exercises are sorted in groupings including proprioception, stretch, release, strength and cardio so that physiotherapists can target a wide range of problems and patients. PhysioAdvisor is a website service and smartphone application designed by experienced physiotherapists and provides a comprehensive range of physiotherapy and injury rehabilitation exercises. The website was launched in 2008 and the first version of the application was launched in 2010. The application provides over 500 exercises and 800 images useful for the general musculoskeletal population. The application was designed as a reference for all ages, patients, athletes, physiotherapists and other health professionals. Exercises are grouped into strengthening, flexibility, pilates, popular programs, balance, swiss ball, foam roller, resistance band and massage ball exercises. The PhysioAdvisor website expresses that the "PhysioAdvisor Exercises" is one of the top selling Health & Fitness apps in Australia. Physiotherapy smartphone applications, which aim to support home exercise programs can help further engage the patient throughout treatment. In healthcare, the term compliance is often defined as the 'patient's behaviours (in terms of taking medication, following diets or executing lifestyle changes) that coincide with healthcare providers' recommendations for health and medical advice' . For the purpose of this discussion, research often uses the term compliance to relate to patient adherence to a program, however we will use the term patient participation as a more engaging term. As mHealth continues to evolve, it is predicted that it will provide the foundation to support self-management, health monitoring, self-directed learning and interactive patient-clinician communications into the future . All of the applications described above facilitate self-management through interactive user face to effectively communicate and deliver exercise programs to the patient. This feature allows the intervention the potential to be more effective by engaging in contextual sensitivity. This is the ability of the technology to shape the intervention based on unique circumstance or the individual's environment . Physioadvisor is one of the most simplistic applications in terms of communicated exercises as it uses a database of more than 500 exercise and 800 images, targeted to the patient directly by the recommendations created through the application. The patient can also bring this application to their physiotherapist where the physiotherapist can then tailor exercises through the app . PT Pal, PhysioTrack and MyPhysioapp incorporate a more interactive environment where the physiotherapist has the option to film the patient demonstrating exercises in clinic and upload directly to their program through the application, in addition to having access to a full database of preloaded exercises. Exercises on each device provide clearly written and verbal instruction for enhanced clarity. If an exercise is not included in any of these applications, a request can be sent directly to the company and they will update the application accordingly. The patient-prescriber relationship is a strong predictor of patient participation throughout treatment and a healthy relationship is built on trust in healthcare professionals . Physiotherapy exercises prescribed through mobile technology can facilitate this relationship by actively engaging the patient with more memorable individualized programs. In conversation with Naveen Khan, CEO and founder of PT Pal, physiotherapists may be initially reluctant to adapt to electronic exercise prescription however they must realize there is not much difference (Catenazzi, Oriana. Conversation with: Naveen Khan. 2015 Nov 16). Research has identified that too little time spent with patients is likely to threaten a patient's motivation to maintain therapy . These applications offer a tangible solution by providing an interactive exercise environment in between sessions. There are several issues with therapeutic non-compliance, including two major clinical issues concerning effect on treatment outcomes and increased financial burden for society . A significant contributing factor to therapeutic non-compliance is the failure to attend scheduled appointments. Research has documented several characteristics contributing to this absenteeism including demographic variables, family responsibility, ethnicity and religion . For the purpose of this discussion, we will only consider the most common reason for not attending appointments, which is forgetfulness (; , ). If the reader would like to further follow up on reasons why outpatients fail to attend their scheduled appointments, please follow this link here. It has been implied that SMS (short message system) reminders can play a role in reducing non-attendance at out-patient clinics . Additionally, researchers have tested the use of SMS across different preventative health behavior interventions and suggested its usefulness to provide patient education, appointment reminders, behavioural interventions, data acquisition and communication between patient and healthcare provider . 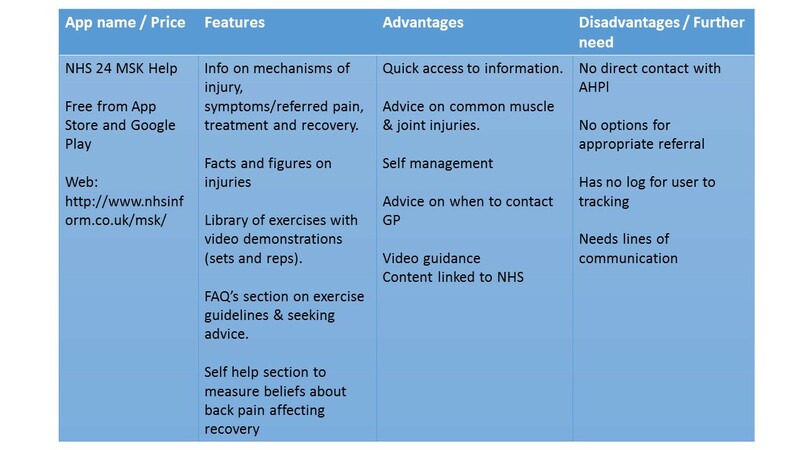 Taking in consideration the applications presented in our review, only PT Pal and PhysioTrack will be critically discussed in this section, as they both offer reminder and message services for the patient. 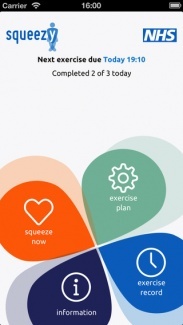 The application MyPhysioapp offers the patient the option to set up exercise reminders (figure featured below), however it does not mention appointment reminders. The message feature appears to benefit the physiotherapy practice, where the clinician is able to send 'push messages' to the patient's phone to inform them about available services, send promotions or links to their website. There is an option for the physiotherapist to incorporate personal comments on the patient program, which the patient receives on the application . This application is clinic branded and offers the patient easily accessible contact details for the clinic through the main app page. MyPhysioapp describes this feature as an opportunity for patients to share the clinic details with friends and family to increase referrals to the clinic. Alternatively, Physioadvisor offers exercise reminders, however since the application is designed primarily as a reference for patients seeking their own information, there is no feature to link reminders with clinic appointments or option to message your physiotherapist . PT Pal has several embedded features to facilitate patient appointment efficiency. Features include incorporating reminder feature in your smartphone for appointment times, but also a schedule optimization feature for better service to patients. This feature allows the clinic to prioritize patients and call you in the event of an appointment opening up . Providing clear information is important as many patients state that lack of understanding is a reason for not attending appointments . Similarly, PhysioTrack sets reminders to the patient's phone for appointment adherence. The website marketing specifically promotes the ability of this app to reduce cancellations . 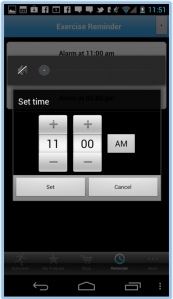 Both of these applications incorporate a reminder system embedded in the software. Several studies have shown the use of SMS reminders to play positive role to play in reducing non-attendance at out-patient clinics . Literature focuses on the SMS feature found across many apps, but limited research is available concerning embedding reminders and messages in smartphone systems utilizing push notifications. For the purpose of this discussion, they will arguably apply similar outcomes, as they offer pop up reminder to attend an appointment. Research is also lacking into physiotherapy musculoskeletal outpatient clinics, as one review looked specifically across 10 major clinical domains including Activities of Daily Living, Alzeheimer's/Dementia care, Chemotherapy symptom management, palliatiave care management, congestive heart failure, chronic obstructive pulmonary disease, diabetes, falls and falls risk, osteoarthritis and dermatology . SMS reminders appear to have a significant impact on adherence to appointments and would be relevant to physiotherapy musculoskeletal outpatient clinics. Additionally, the use of SMS and increased communication between the patient and physiotherapist can further benefit patient participation in a rehabilitation program. Both PT Pal and PhysioTrack allow the physiotherapist to message the patient through the application to see check in on their efforts. Alternatively, the patient can also respond and send messages to their physiotherapist if they have any questions or concerns. 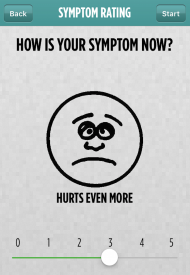 Both systems send messages using push notifications through their software, however Physiotrack also mentions sending an SMS or e-mail as an alternative if the message can not be received by the patient as outlined by the video below.This is an important feature as tailored health messages are more engaging and effective at changing behavior than untailored, bulk messages . Recent research has identified that text-messaging improves outcomes in a outpatient cardiovascular rehabilitation setting. In this study, text messages were sent 3-5 times weekly and consisted of heart-healthy tips, requests for weight and blood pressure input and minutes of exercise per day as well as medication adherence . Results from this study indicated that the addition of SMS is cost-effective and significantly improves outcomes and compliance alongside a traditional cardiorehabilitaiton program . Historically, SMS represents the most frequently used mobile phone feature in research focused on the role of mobile phones as a tool for encouraging and monitoring health, with much of this literature is specifically centered on diabetes management and weight loss . Text messages were most often used to send motivational messages, educational information, social support and for self-monitoring . It would be beneficial to identify research supporting these physiotherapy applications and the future ways that physiotherapy smartphone applications can incorporate messages to stimulate behavior change. In conversation with Naveen Khan, PT Pal has several ongoing studies that will be published in the upcoming year (Catenazzi, Oriana. Conversation with: Naveen Khan. 2015 Nov 16). Another strong predictor on patient participation in healthcare is effective patient knowledge about their condition and course of action. Patient education is extremely important to enhance therapeutic compliance and healthcare providers should supply patients with adequate education about their treatment and disease . All of the smartphone applications discussed provide additional resources relevant to the patient's condition. PhysioTrack is partnered with the University of Dublin and SportEx to keep up to date with relevant research protocols. Additionally, PhysioTrack allows physiotherapists to send their patient relevant information and research about their condition . Similarly, MyPhysioapp allows physiotherapists to provide their patients with relevant health topics like diagnosis, self-management concepts and general health literacy . PT Pal is partnered with various hospitals to stay up to date on clinical protocols and has recently appointed a clinical advisor, Dr. Russel Carter to their team . This allows the application to communicate up to date research with their clients. Lastly, PhysioAdvisor incorporates additional information through an injury profile library to help inform and educate patients . Education for patients is important as many patients describe not attending appointments because they perceived that their appointment was unnecessary. Providing clear information to patients is important since many patients appear to lack understanding over their own healthcare . Communicating relevant information about the patient's condition can further engage the patient in his or her own treatment concerns and builds a greater understanding and partnership with the physiotherapist. Finally, the importance of communicating the appropriate exercise prescription in an interactive manner is discussed. 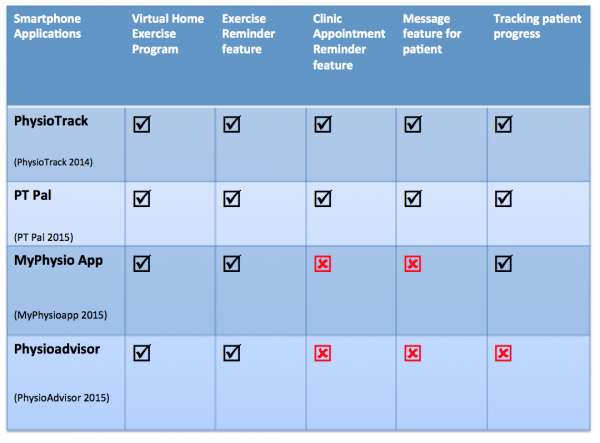 mHealth applications creates new opportunities for patients to strengthen their relationship with their therapist, reinforce standing of the plan of care, confirm home exercise techniques and proactively address relevant concerns . PT Pal is arguably the most interactive device of them all as the exercise programs offers an audio option to count sets and reps as well as overall duration of the program. In addition to this, pop-up motivational notifications can inform a patient when they are almost done their exercises . Importantly, PT Pal has the feature to collect pain and difficulty feedback from patients to help tailor exercise prescriptions and adapt programs in real time. 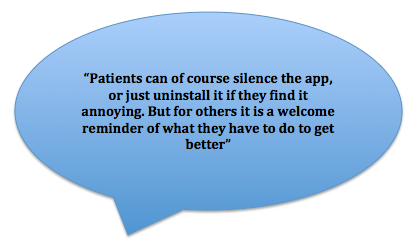 When asked how physiotherapists have responded to using the app, Naveen Khan has stated the following: (Catenazzi, Oriana. Conversation with: Naveen Khan. 2015 Nov 16). Rehabilitation professionals can utilize this information to better understand any relevant environmental factors affecting exercise adherence as well as utilizing this real time data to receive patient feedback that is less subjective to recall bias in future appointments . Physiotherapists' who use PT Pal can monitor patient progress remotely and send reminders or follow up notes to patients who may not be completing their program or appear to be having difficulty. The patient confirms (with a click of the box) once an exercise is completed, allowing the patient to keep track themselves. Additionally, the patient who uses PT Pal has their program stored in the application which they can share with other health professionals. In this way, it keeps all health professionals informed on the quality of care and they can work together remotely. PT Pal is continually evolving and targeting the application to more health professionals. Similarly, MyPhysioapp also requests the patient's current symptom using a VAS scale (1-5) once they start their program (figure featured to the left). The application incorporates timed sets, reps and rest intervals. Upon completion of the program, the patient has the option to write any relevant notes or comments on their personal progress. The patient can then use this information to track progress and monitor their symptoms over the duration of their physiotherapy program. In comparison, PhysioTrack stores the patient's exercise prescription history and offers a 'compliance button' for the patient to track when they complete their exercises. This information is sent directly to the physiotherapist's portal where they can monitor patient's progress. Physiotherapists have the option to track the patient's progress with a reporting feature on their account. As we have evaluated, PhysioAdvisor does not offer any reporting option or tracking program to monitor patient compliance with the program. An important feature for patient participation in healthcare is accessibility and satisfaction with the healthcare facilities . These physiotherapy applications helps to promote healthcare facilities remotely in the patient's own environment. An important feature of the application is that is must be useful and usable, and this may link with adoption and frequent use of mobile application . If the physiotherapist is able to communicate effectively with the patient about their condition, treatment and home exercise options using any of these applications, there will likely be improved patient participation and engagement with their rehabilitation process. This section will critically analyze how using physiotherapy smartphone applications can help promote motivation and enhance outcomes relating to quality of life through elicitation of behavioural changes in patients. As previously described in the above sections, the Self Determination Model distinguishes between different types of motivation and how this impacts on behavior. Unfortunately, effective strategies to promote behavior change in individuals with little or no motivation to change are relatively scarce. These motivational states exist on a continuum between amotivation and intrinsic motivation, and it is up to the physiotherapist to identify what factors will help the patient engage in treatment. For an individual who is intrinsically motivated, the use of physiotherapy smartphone applications may be enjoyable due to their inherent desire to challenge themselves. PT Pal, MyPhysio App and PhysioTrack allow the patient to keep track of their own progress electronically, which they might enjoy. However, intrinsic motivation may play more of a role in maintaining healthy behaviour following discharge from physiotherapy, when a patient may choose to continue preventative exercises or participate in an activity or sport for fun to keep healthy. However, these apps might further support individuals who are more extrinsically motivated since the applications create a direct partnership with the physiotherapist and allows these individuals to be externally regulated and tracked to support their motivation. PT Pal, MyPhysio App and PhysioTrack allow the physiotherapist to monitor if the patient is accomplishing their program as well as the option to send text messages as additional reminders and motivation if required. Importantly, all applications provide the patient with educational resources, further allowing the patient to identify with their condition and the importance of their behavior to accomplish the rehabilitation program in order to improve. Mobile phone technology offers convenient real-time self-monitoring as well as timely delivery of feedback, which are two strategies to facilitate behavior change. There are three basic human needs proposed for self-determination which motivate people to initiate behaviour: autonomy, competence and relatedness. It can be argued that all three needs can be impacted by the use of these physiotherapy applications. Firstly, autonomy can be promoted by a physiotherapist-patient relationship where the patient is engaged with their condition and feels that it is their decision to use the smartphone home exercise program. Secondly, competence allows the patient to take the smartphone home exercise program into his or her own environment and feel mastery over their ability to complete the exercise. Lastly, relatedness allows the patient to feel cared for by the physiotherapist and connected through effective lines of communication that certain applications offer. General findings show that patients who have emotional support and help from not only family and friends but also their healthcare providers, are more likely to participate in treatment. The use of smartphone applications may in fact increase the experience of these three domains, which will foster motivation and result in enhanced performance. In addition to motivational constructs identified in the Self Determination theory, the first three phases of the Transtheoretical model are motivational in nature, and include proposed processes of change. The physiotherapist can engage the patient to move through the stages with efforts such as reinforcement management, where the physiotherapist has monitored patient progress through the application and rewards the patient on making changes. The patient can also be impacted by consciousness raising, where the patient finds out more of the effects of the behavior by engaging in the home exercise program and reading up on literature about their condition. As previously mentioned, patient education is very important to enhance compliance  alongside the stage the patient is at in their readiness to change. By applying these motivational aspects in various physiotherapy applications, patients will be more likely to change their behaviours during and after rehabilitation. The Transtheoretical model is intrinsically linked to self-efficacy; see more below. This again will help motivate the patient to complete these exercises and ultimately through positive encouragement, the patient will feel their self-efficacy improve and belief in their own abilities to succeed begin to flourish. Goal setting will have a profound effect on compliance as it is intrinsically linked with self-efficacy. In home exercise programmes, it is important the physiotherapist and the patient both work together to set and achieve goals which are specific, measurable, achievable, realistic and have a time-frame to work towards; in other words, these goals will be S.M.A.R.T.. Similar to other models, goal setting is most effective when feedback is received by both the physiotherapist and the patient; this ensures that both parties can understand what stage the patient is at in terms of rehabilitation and support them as required. 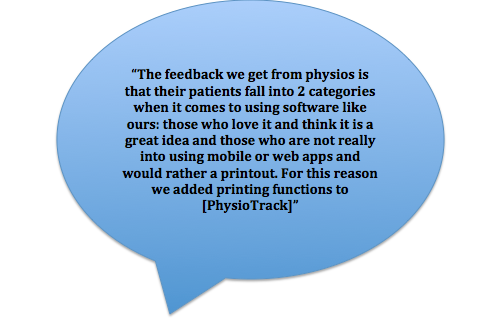 Feedback is provided in PT Pal, MyPhysio App and PhysioTrack as shown in the above table. “A theory of goal setting and task performance”, developed by Locke et al. 1990, also discusses that these goals should follow five fundamental principles. Clarity is ensured by all four applications as a home exercise programme will either be created virtually, stored online, printed or emailed so the patient can go back to see the immediate short-term goals decided upon by the patient, or the patient alongside the physiotherapist. Goals also have to be challenging but not too complex; applications that will allow constant communication between the Physiotherapist and patient ensures that the task or exercise is attainable but not too simplistic for the patient to perform. Commitment is equally important and patient progress monitoring as well as messaging allows the physiotherapist to analyse and understand the patient’s growth over time so feedback can be communicated to the patient. While goals can be promoted through Physioadvisor, feedback is not provided through the applications and thus self-efficacy and goal setting will not have a large effect on behaviour change for the patient. Currently, there is limited research measuring the usage of a health-related smartphone application and its effect on the behavior of users. The majority of health applications available for consumers are funded by commercial companies, which are disinclined to distribute their usage information in a competitive market . Further research is necessary to help support the connections we have discussed between smartphone physiotherapy apps and behaviour change models. The common occurrence of patients’ failing to attend scheduled appointments is estimated to cost 65 pounds per incidence. This results in underutilization of the healthcare system as well as prolonged waiting lists . A smartphone application is a potential method to prevent cancellations through effective reminder systems. Each application costs a small renewable fee which is based on the number of physiotherapists and or clinics that require subscription (except for Physioadvisor which is a one time nominal fee for the patient). Important to note is that therapeutic non-compliance has been associated with excess urgent care visits, hospitalizations and higher treatment costs . These applications can be seen as an investment for the clinic or hospital to help increase efficiency, reduce cancellations and prevent future health care demand. The Scottish Government understands this priority and accepts the relevance of such applications as ways to manage rising costs and demand as mentioned in the National Delivery plan . Scotland has started to recognize the way forward with ‘Scotland’s Digital Future’ and its benefits by providing a significant investment in telehealth. NHS 24 continues to work with NHS boards to develop the use of healthcare in all health-related areas . While these applications provide an exciting new outlet for physiotherapy to proceed towards in the future, there are some barriers and limitations to the successful implementation of these new technologies. Through a discussion and understanding of these obstacles, further research can be directed at ways to improve and adapt technologies to suit the current needs of healthcare. Seminars providing education and information about the potential provided by these applications and the benefits it could lend may be helpful in overcoming these obstacles. Furthermore, as adults get older, there are decreases in overall dexterity and fine motor control, as well as corresponding losses of visual and auditory acuity. Users including Physiotherapists and patients with functional impairments, may not be able to efficiently or correctly utilize currently available mobile platforms to their fullest potential. A preference has also been shown towards hardware buttons and machinery rather than touch screen technology in older adults, who may not immediately recognize new and important information changes on their homescreen. As a result, it may be difficult to ensure that these technologies are being employed correctly by physiotherapists and patients, and thus not providing complete and full rehabilitation. Changes in the workforce and operational delivery may require new skills, competencies and standards to be developed once more research has been produced so clinicians can ensure they have the correct tools to perform these services; therefore education is extremely important. Awareness of the credibility of the information presented in smartphone applications is essential to ensure the safety of patients and reputability of all physiotherapists. The danger in using smartphone applications is that there exists no current regulation for health advice provided on smartphone applications as it is such a fairly new technology . In another study conducted, researchers found that 47 smartphone applications for smoking cessation had low levels of adherence to established guidelines . They have recommended that all future applications be created around evidence-based practices. All of the applications we have examined above have made an effort to comply with the regulations and examine evidence-based research before inclusion of an exercise. 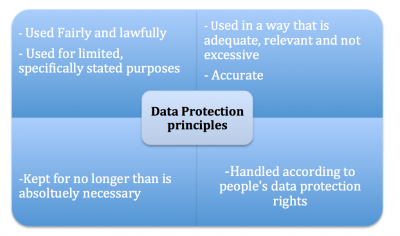 For more on data protection and the regulations in using these specific apps, take a look at the section below under KEY POINTS. Government highlights for our way forward, we need to improve sustainability and value by establishing a baseline, and developing consistent outcome measures and indicators to track the impact of telehealth and telecare on working practices, productivity and resource use . Future research is necessary to focus on these novel physiotherapy applications and the effect on patient behavior change and patient experience. Research should also target physiotherapy programs administered via these applications to identify any advances in rehabilitation and home exercise programs. As the Scottish Government identifies, we need to raise awareness, publish and promote innovative approaches, good practice and illustrate user/patient experiences to further develop good practice . The physiotherapy smartphone applications discussed in this wiki page have identified a new and emerging area in physiotherapy to better our practice and further facilitate the patient-physiotherapist relationship. The list of smartphone physiotherapist applications is not exhaustive, and many other applications currently exist and will be created in the future. The information presented here should allow the reader to identify key features provided in smartphone applications that may enhance the physiotherapist-patient relationship. Physiotherapists need to be aware of the expanding significance of telerehabilitation as new technology might offer further support to our patients. To test your knowledge on the information presented in this wiki, please take this test. In order to gain access you must include your name, however simply write 'test' if you prefer to stay anonymous. If you are interested in NHS specific health applications, follow this link to the NHS Health Apps Library page. Information is available to the reader to find interactive tools, apps and podcasts to manage health as well as links to the project roadmap to understand how patient-focused health applications can be recommended. ↑ 3.0 3.1 3.2 3.3 3.4 Brennan DM, Mawson S, Brownsel S. Telerehabilitation: enabling the remote delivery of healthcare, rehabilitation and self management. Studies in Health tech and inform. 2009;123:231. ↑ 4.0 4.1 4.2 4.3 4.4 4.5 4.6 Theodoros D, Russell T. Telerehabilitation: current perspectives. Stud Health Technol Inform 2008;131:191. ↑ Kairy D, Lehoux P, Vincent C, Visintin M. A systematic review of clinical outcomes, clinical process, healthcare utilization and costs associated with telerehabilitation. Disabil Rehabil. 2009;31(6):427. ↑ Temkin AJ, Ulieny GR, Vesmarovich SH. Telerehabilitation: a perspective of the way technology is going to change the future patient treatment. Rehab management. 1996;9:28. ↑ Dexter PR, Miller DK, Clark DO, Weiner M, Harris LE, Livin L, Mysers I, Shaw D, Blue L, Kunzer J, Overhage JM. Preparing for an aging population and improving chronic disease management. AMIA Annu Symp Proc. 2010;2010:162. ↑ Office for National Statistics. Population Ageing in the United Kingdom, its Constituent Countries and the European Union. Office for National Statistics, 2012. ↑ Cracknell R. The ageing population. House of Commons Library Research. 2010. ↑ Kortke H, Stromeyer H, Zittermann A, Buhr N, Zimmermann E, Wienecke E. New east-westfalian postoperative therapy concept: A telemedicine guide for the study of ambulatory rehabilitation of patients after cardiac surgery. Telemed J E Health. 2006;12(4):475. ↑ Rogante M, Grigioni M, Cordella D, Giacomozzi C. Ten years of telerehabilitation: A literature overview of technologies and clinical applications. NeuroRehabilitation. 2010;27:287. ↑ Korner-Bitensky N, Wood-Dauphinee S. Barthel Index information elicited over the telephone. Is it reliable?, American Journal of Physical Medicine and Rehabilitation. 1995;74(1):9. ↑ Wertz RT, Dronkers NF, Bernstein-Ellis E, Sterling LK, Shubitowski Y, Elman R, Shenaut GK, Knight RT, Deal JL. Potential of telephonic and television technology for appraising and diagnosing neurogenic communication disorders in remote settings. Aphasiology. 1992;6:195. ↑ Brennan D, Georgeadis A, Baron C, Barker L. The effect of videoconference-based telerehab on story retelling performance by brain injured subjects and its implications for remote speech-language therapy. Telemedicine Journal and e-Health. 2004;10(2):147. ↑ Russell TG, Buttrum P, Wootton R, Jull GA. Internet-based outpatient telerehabilitation for patients following total knee arthroplasty: a randomised controlled trial. J Bone Joint Surg Am, 2011;93(2):113. ↑ Zheng K, Padman R, Johnson MP, Diamond HS. Understanding technology adoption in clinical care: clinician adoption behaviour of a point-of-care reminder system. Int J Med Inf. 2005:74(7-8):535. ↑ Cooper DB, Wilis A, Andrews S, Baker J, Cao Y, Han D, Kang K, Kong W, Leymarie F, Orriols X, Vote E, Joukowsky M, Kimia B, Laidlaw D, Mumford D, Velipasalar S. Assembling virtual pots from 3D measurements of their fragments. Proceedings of VAST. 2001:241. ↑ Kamel-Boulos M, Brewer A, Karimkhani C, Buller D, Dellavalle R. Mobile medical and health apps: state of the art, concerns, regulatory control and certification. J of Public Health Inform. 2014;5(3):229. ↑ West, D. How Mobile devices are Transforming Healthcare.Issues in Technology Innovation 2012; (18): . https://vacloud.us/sandbox/groups/5069/wiki/a69cb/attachments/1ddb8/Brookings%20-%20How%20Mobile%20Devices%20are%20Transforming%20Healthcare.pdf (accessed 25 November 2015). ↑ NHS Choices. Tools - Interactive tools, smartphone apps and podcasts. http://www.nhs.uk/tools/pages/toolslibrary.aspx?Tag=&Page=1 (accessed 3 December 2015). ↑ NHS Choices. Health Tools: Interactive tools, smartphone apps and podcasts. http://www.nhs.uk/tools/pages/toolslibrary.aspx?Tag=&Page=1 (accessed 25 November 2015). ↑ 24.0 24.1 24.2 24.3 24.4 24.5 24.6 Scottish Government. 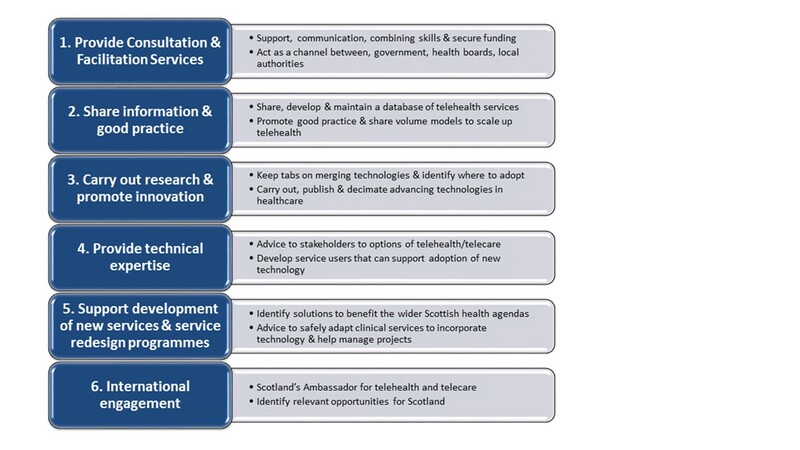 A National Telehealth and Telecare Delivery Plan for Scotland to 2015 – Driving Improvement, Integration and Innovation. http://www.gov.scot/resource/0041/00411586.pdf (accessed 25 November 2015). ↑ Scottish Centre for Telehealth & Telecare. 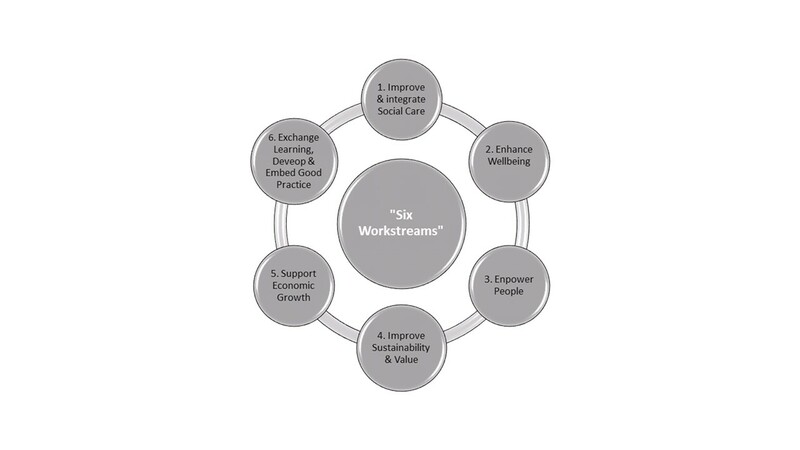 Supporting Improvement, Integration and Innovation - Business Plan 2012-2015. http://sctt.org.uk/programmes/ (accessed 25 November 2015). ↑ 26.0 26.1 The Scottish Government. National Telehealth and Telecare Delivery Plan for Scotland to 2016. http://www.gov.scot/Publications/2012/12/7791 (accessed 25 November 2015). ↑ 27.0 27.1 The Scottish Government. A National Telehealth and Telecare Delivery for Scotland to 2016: Driving Improvement, Integration and Innovation. http://www.gov.scot/Publications/2012/12/7791/5 (accessed 25 November 2015). ↑ 28.0 28.1 Scottish Centre for Telehealth & Telecare. Supporting Improvement, Integration and Innovation - Business Plan 2012-2015. http://sctt.org.uk/programmes/ (accessed 25 November 2015). ↑ Audit Scotland. A Review of Telehealth Impact Report. A Review o Telehealth 2013; (): . http://www.audit-scotland.gov.uk/docs/health/2013/ir_130613_telehealth.pdf (accessed 25 November 2015). ↑ The Scottish Government. 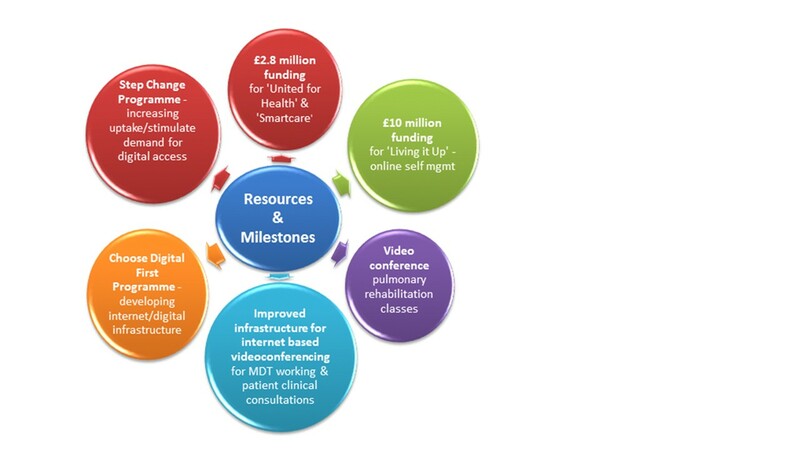 A National Telehealth and Telecare Delivery Plan for Scotland to 2015 – Driving Improvement, Integration and Innovation. http://www.gov.scot/resource/0041/00411586.pdf (accessed 25 November 2015). ↑ Gale, N., Sultan, H. Telehealth as ‘piece of mind’: embodiment, emotions and the home as the primary health space for people with chronic obstructive pulmonary disorder. Health and Place 2013; 21(): . http://www.sciencedirect.com/science/article/pii/S1353829213000129 (accessed 25 November 2015). 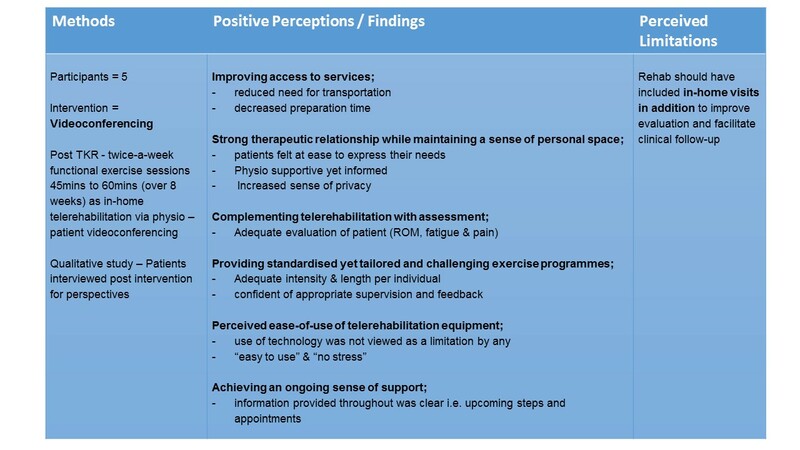 ↑ Dahlia, K., Tousignant, M., Leclerc, N., Cote, A., Levasseur, M. The Patient’s Perspective of in-Home Telerehabilitation Physiotherapy Services Following Total Knee Arthroplasty. Public Health 2013; 10(): . http://www.ncbi.nlm.nih.gov/pmc/articles/PMC3799503/pdf/ijerph-10-03998.pdf (accessed 25 November 2015). ↑ 33.0 33.1 33.2 Riley WT, Rivera DE, Atienza AA, Nilsen W, Allison SM, Mermelstein R. Health behavior models in the age of mobile interventions: are our theories up to the task? Translational behavioral medicine 2011;1(1):53-71. ↑ Ruiz EC, Hierro MG, Torres PM, Massoomi F, Brown ME, May-Russell S, et al. PHARMACY. 2012. ↑ PATRICK, K., RAAB, F., ADAMS, M. A., DILLON, L., ZABINSKI, M., ROCK, C. L. GRISWALD, W.G. AND NORMAN, G. J. (2009). A text message–based intervention for weight loss: randomized controlled trial. Journal of medical Internet research. vol.11, no.1. ↑ PROCHASKA, J. AND DICLEMENTE, C (1983). 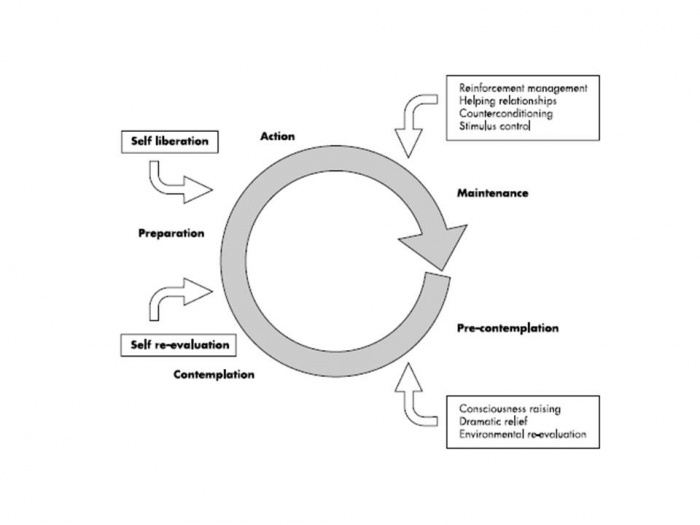 Stages and processes of self- change in smoking: toward an integrated model of change. Journal of consulting and clinical psychology. Vol.5. pp. 390-395. ↑ 37.0 37.1 37.2 37.3 PROCHASKA, J. O., DICLEMENTE, C. C., AND NORCROSS, J. C. (1992). In Search of How People Change: Applications to the Addictive Behaviors. American Psychologist. vol. 47, pp.1102–1114. ↑ ADAMS, J. AND WHITE, M. (2003). Are activity promotion interventions based on the transtheoretical model effective? a critical review. British Journal of Sports Medicine. vol.37, no.2. pp.106-114. ↑ 39.0 39.1 39.2 GLANZ, K., RIMER, B. K. AND VISWANATH, K. (2008). Health behavior and health education: theory, research, and practice. John Wiley & Sons. ↑ 40.0 40.1 VELICER, W. F, PROCHASKA, J. O., FAVA, J. L., NORMAN, G. J. AND REDDING, C. A. (1998). Smoking cessation and stress management: Applications of the transtheoretical model of behavior change. Homeostasis. Vol.38. pp. 216–233. ↑ 41.0 41.1 41.2 BANDURA, A. (1982). Self-efficacy mechanism in human agency. American psychologist. Vol. 37, no. 2. pp.122. ↑ VELICER, W. F., DICLEMENTE, C. C., ROSSI, J. S. AND PROCHASKA, J. O. (1990). Relapse situations and self-efficacy: An integrative model. Addictive Behaviors. vol. 15. PP. 271–283. ↑ DICLEMENTE, C. C. (2003). Addiction and change: How addictions develop and addicted people recover. Guilford: New York. ↑ OBERMAYER, J.L., RILEY, W.T., ASIF, O. AND JEAN-MARY J. (2004). College smoking-cessation using cell phone text messaging. J Amer Coll Health. vol. 53. pp. 71–78. ↑ 45.0 45.1 RILEY, W.T., OBERMAYER, J. AND, JEAN-MARY, J. (2008). Internet and mobile phone text messaging intervention for college smokers. J Amer Coll Health. vol.57. pp. 245–248. ↑ 46.0 46.1 HOMA, D. AND PETERSON, D. (2005) Using the international classification of functioning, disability and health (ICF) in teaching rehabilitation client assessment. Rehabil Educ. Vol. 19 pp. 119–28. ↑ BANDURA, A. (1977). 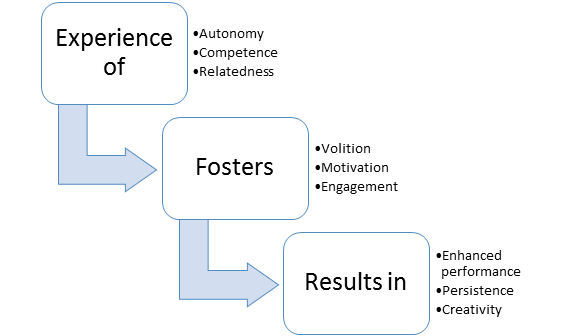 Self-efficacy: Toward a unifying theory of behavioral change. Psychological Review. vol. 84, no. 2. pp. 191–215. ↑ EYSENCK, H.J. (1978). Expectations as causal elements in behavioural change. Advances in Behaviour Research and Therapy. Vol. 1. pp. 171– 175. ↑ BANDURA, A. AND CERVONE, D. (1983). Self-evaluative and self-efficacy mechanisms governing the motivational effects of goal systems. Journal of Personality and Social Psychology. Vol.45. pp. 1017–1082. ↑ 52.0 52.1 52.2 LEE, L. L., ARTHUR, A. AND AVIS, M. (2008). Using self-efficacy theory to develop interventions that help older people overcome psychological barriers to physical activity: a discussion paper. International journal of nursing studies. vol.45, no.11. pp.1690-1699. ↑ LACHMAN, M., JETTE, A., TENNSTEDT, S., HOWLAND, J., HARRIS, B. AND PETERSON, E. (1997). A cognitive–behavioural model for promoting regular physical activity in older adults. Psychology Health and Medicine. Vol.2. pp. 251–261. ↑ KING, A.C., BLAIR, S.N., BILD, D.E., DISHMAN, R.K., DUBBERT, P.M., MARCUS, B.H., OLDRIDGE, N.B., PAFFENBARGER JR., R.S., POWELL, K.E. AND YEAGER, K.K. (1992). Determinants of physical activity and interventions in adults. Medicine and Science in Sports and Exercise. vol.24. pp. 221–236. ↑ CLARK, D.O. (1999). Identifying psychological, physiological, and environmental barriers and facilitators to exercise among older low income adults. Journal of Clinical Geropsychology. Vol. 5. pp. 51–62. ↑ LIAN, W.M., GAN, G.L., PIN, C.H., WEE, S. AND YE, H.C. (1999). Correlates of leisure-time physical activity in an elderly population in Singapore. American Journal of Public Health. Vol. 89. pp.1578–1580. ↑ ALLISON, M.J. AND KELLER, C. (2004). Self-efficacy intervention effect on physical activity in older adults. Western Journal of NursingfckLRResearch. Vol. 26. pp. 31–46. ↑ ALLEN, J.K. (1996). Coronary risk factor modification in women after coronary artery bypass surgery. Nursing Research. Vol.45. pp.260–265. ↑ CALFAS, K. J., SALLIS, J. F., OLDENBURG, B. AND FRENCH, M. (1997). Mediators of change in physical activity following an intervention in primary care: PACE. Preventive Medicine. Vol. 26. pp. 297–304. ↑ MCAULEY, E., LOX, C., RUDOLPH, D. AND TRAVIS, A. (1994). Self-efficacy and intrinsic motivation in exercising middle aged adults. Journal of Applied Gerontology. vol.13. pp.355–370. ↑ 61.0 61.1 ASHFORD, S., EDMUNDS, J. AND FRENCH, D. P. (2010). What is the best way to change self‐efficacy to promote lifestyle and recreational physical activity? A systematic review with meta‐analysis. British journal of health psychology. Vol.15. no.2. pp.265-288. ↑ DUNN, A.L., MARCUS, B.H., KAMPERT, J.B., GARCIA, M.E., KOHL III, H.W. AND BLAIR, S.N. (1999). Comparison of lifestyle and structured interventions to increase physical activity and cardiorespiratory fitness: a randomized trial. Journal of The American Medical Association. vol.281. pp.327–334. ↑ LEE, L.L., AVIS, M. AND ARTHUR, A. (2007). The role of self-efficacy in older people’s decisions to initiate and maintain regular walking as exercise—findings from a qualitative study. Preventive Medicine. vol.45. pp. 62–65. ↑ SALLIS, J.F., PINSKI, R.B., GROSSMAN, R.M., PATTERSON. AND T.L., NADER, P.R. (1988). The development of self-efficacy scales for healthrelated diet and exercise behaviors. Health Education Research. vol.3. pp.283–292. ↑ Ryan RM, Deci EL. Self-determination theory and the facilitation of intrinsic motivation, social development, and well-being. Am Psychol 2000;55(1):68. ↑ Ryan RM, Deci EL. 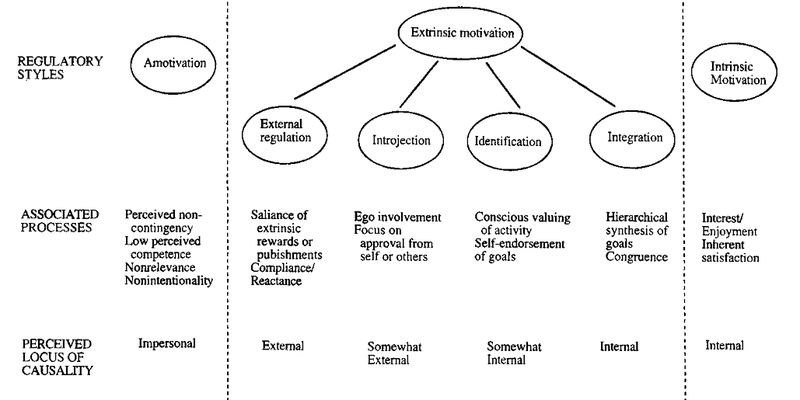 Intrinsic and extrinsic motivations: Classic definitions and new directions. Contemp Educ Psychol 2000;25(1):54-67. ↑ Teixeira PJ, Silva MN, Mata J, Palmeira AL, Markland D. Motivation, self-determination, and long-term weight control. Int J Behav Nutr Phys Act 2012;9(1):22. ↑ Cocosila M, Archer N. Adoption of mobile ICT for health promotion: an empirical investigation. Electronic Markets 2010;20(3-4):241-250. ↑ Rosland A, Heisler M, Piette JD. The impact of family behaviors and communication patterns on chronic illness outcomes: a systematic review. J Behav Med 2012;35(2):221-239. ↑ 73.0 73.1 Ryan RM, Deci EL. Self-determination theory and the facilitation of intrinsic motivation, social development, and well-being. Am Psychol 2000;55(1):68. ↑ Ryan R. Self determination theory and well being. Soc Psychol;84:822-848. ↑ Sanli EA, Patterson JT, Bray SR, Lee TD. Understanding self-controlled motor learning protocols through the self-determination theory. Frontiers in psychology 2012;3. ↑ Visser C. Self-determination theory meets solution-focused change: Autonomy, competence and relatedness support in action. InterAction-The Journal of Solution Focus in Organisations 2010;2(1):7-26. ↑ 77.0 77.1 77.2 77.3 Locke EA. Motivation through conscious goal setting. Applied and Preventive Psychology 1996;5(2):117-124. ↑ 79.0 79.1 Doran GT. There’sa SMART way to write management’s goals and objectives. Manage Rev 1981;70(11):35-36. ↑ Bovend'Eerdt TJ, Botell RE, Wade DT. Writing SMART rehabilitation goals and achieving goal attainment scaling: a practical guide. Clin Rehabil 2009 Apr;23(4):352-361. ↑ Maclean N, Pound P. A critical review of the concept of patient motivation in the literature on physical rehabilitation. Soc Sci Med 2000;50(4):495-506. ↑ 82.0 82.1 DiMatteo RM. Variation in Patients’ Adherence to Medical Recommendations: A Quantitative Review of 50 Years of Research. Medical Care 2004; 42: 200-9. ↑ Dean SG, Smith, JA, Payne S, Weinman J. Managing time: An interpretative phenomenological analysis of patients’ and physiotherapists’ perceptions of adherence to therapeutic exercise for low back pain. Disability and Rehabilitation 2005; 27: 625-36. ↑ 89.0 89.1 MyPhysio App. MyPhysio App home page. http://myphysioapp.com.au/home/ (accessed 4 Nov 2015). ↑ 96.0 96.1 96.2 JIN, J., SKLAR, G.E., MIN SEN OH, V., and CHUEN LI, S.. Factors affecting therapeutic compliance: A review from the patient’s perspective. Journal of Therapeutics and Clinical Risk Management 2008; 4: 269-86. ↑ Hardcastle SJ, Hancox J, Hatter A, Maxwell-Smith C, Thorgersen-Ntoumani, Hagger MS. Motivating the unmotivated: how can health behavior be changed in those unwilling to change? Frontiers in Pyschology 2015; 6: 1-4. ↑ Bandura A. Self-Efficacy: Toward a unifying theory of behaviour change. Psychological Review 1977; 84: 191-215. ↑ 99.0 99.1 Rebellato, Alicia. PhysioTrack and Physiopedia. Message to: Anthony Nolan. 2015 Oct 31 [cited 2015 Nov 20]. ↑ 100.0 100.1 100.2 Kirwan M, Duncan, MJ, Vandelanotte C, Mummery, WK. Using Smartphone Technology to monitor physical activity in the 10,000 Steps program: a matched case-control trial. J Med Internet Res 2012; 14: e55. ↑ Abroms LC, Padmanabhan N, Thaweethai L, Phillips T. iPhone apps for smoking cessation: a content analysis. Am J Prev Med 2011; 40: 279-85.